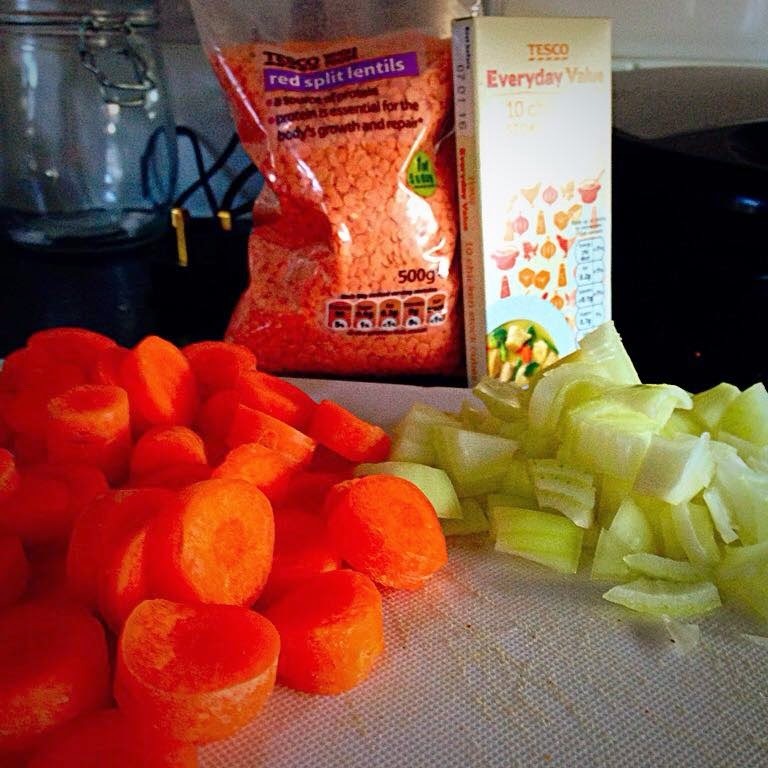 For the first of my 'Happier and Healthier' series, I thought I'd share a recipe for lentil soup. If you haven't already seen by what I mean by Happier and Healthier, then check out my intro post here! One thing I've been working on this year is eating better - more fruit and veg - and that includes making my own soup. Soup in my house signifies the start of autumn / winter. My mum always makes her own soup, SO many different recipes, all of which are so lovely, and so much better than the shop bought canned stuff. It's easier to stick that in the microwave to heat up, sure, but its so much tastier and healthier actually making your own. AND it doesn't have to be difficult! 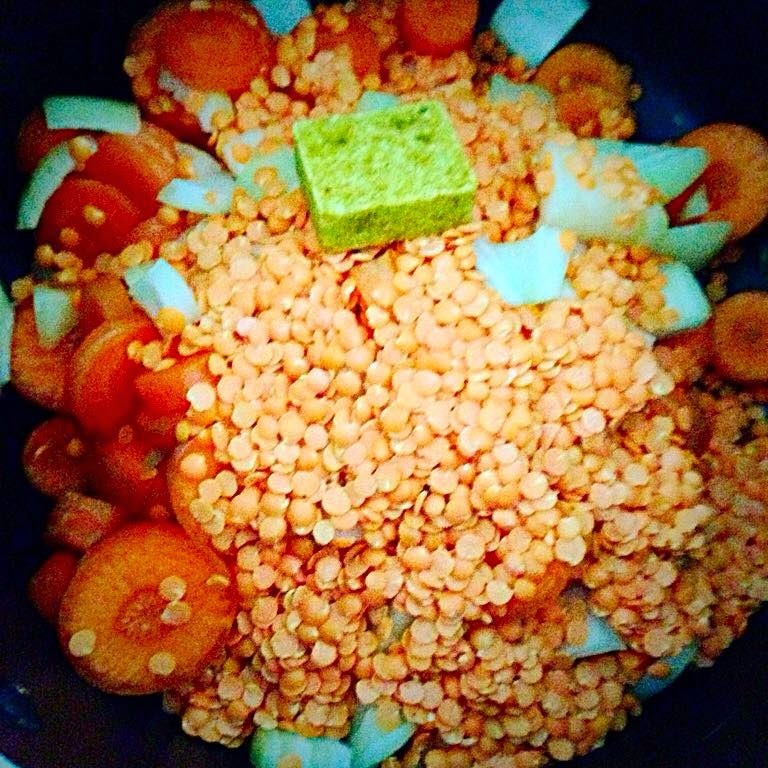 My mum sent me down the recipe for her smooth lentil soup, although I had to adjust some of the quantities for a smaller batch, it was so easy and tastes amazing (not tooting my own horn or anything!). Prepare by cutting up the 3 carrots and the onion into small blocks. Fill the pan with boiling water, enough to cover the ingredients then the same volume again- about 2/3 of a kettle. Bring to the boil, and leave to cook for 20 minutes. Reduce the heat, until the lentils have expanded and gone soft. Add seasoning to your preference. Transfer the soup to a blender and blend until the mixture is smooth. It really is that simple! It takes no time at all to make the soup, and the smell that fills the kitchen is incredible. This batch makes enough for about 3 bowls, so I froze some of it to come back to later on. That's the beauty of the soup in that you can freeze it and it's ready just to be defrosted and reheated for another day. Let me know if you gave it a go, or if you have a soup recipe for me to try! Have a look at my last recipe here!